The brand new “ICBC Securities” Mobile Application has been launched by ICBC(Asia)! ICBC (Asia) offers full range of banking services: deposits, loans, credit cards, securities, funds and insurance etc. Professional teams at ICBC (Asia) are dedicated to provide quality private banking services to our elite customers. Provide a broad range of commercial banking services to help you manage your business efficiently. ICBC (Asia) offer secure, fast, accurate and convenient investment services. Using treasury products to meet operating demand and preserve asset value. Information technologies are changing our way of living in the new-era.With the eBanking Services, you can handle your finance at ease. 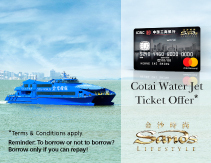 Apply for ICBC Credit Card to enjoy Welcome Offer and fabulous privileges all year-round! To cater for all your personal financial needs, we offer you different kinds of etools and calculators or better financial control and planning. Copyrights © Industrial and Commercial Bank of China ( Asia ) Limited. All rights reserved.